July 1936. "Migratory workers' camp in Yakima, Washington." 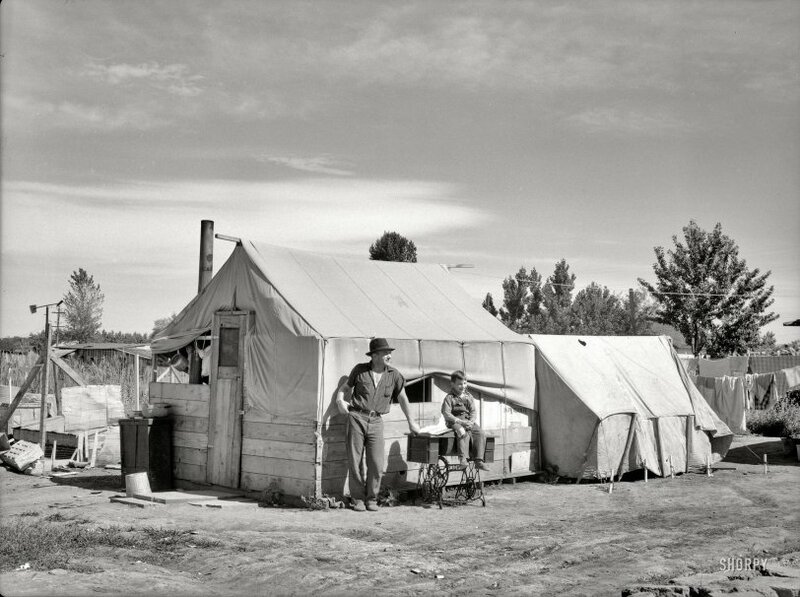 Displaced farm families from the Dust Bowl states working as laborers in the Northwest's fruit orchards, living in government-run tent camps. Medium-format nitrate negative by Arthur Rothstein for the Resettlement Administration. View full size. Submitted by A Californian on Tue, 08/07/2012 - 11:24am. Some wear them well, others not so well. This man had looking debonair nailed even in a numbingly humble situation. Submitted by Tobacconist on Tue, 08/07/2012 - 11:48am. That weather vane is just for showing the direction of the wind—this one has a propeller on the front that would spin in the breeze. I have a Singer pedestal sewing machine just like that one in my small collection, and I once helped build a tent house virtually identical to that one for a museum display. It was surprisingly comfortable, but then, I didn't have to live in it. Submitted by noelani on Wed, 08/08/2012 - 10:45am. Photos like these remind me to be thankful that my parents, who were born the very end of the 1920s, were both from Washington. My father's hometown is Ellensburg, which is very close to Yakima, and my mother was from Walla Walla, down near the Oregon state line. Their families weren't totally unaffected by the depression, but the land didn't turn against them, like it did in much of the country. My mother's people were farmers. Although she and her parents had to live with Grandpa's parents until 1934, and things like new clothing were rare, they always had plenty to eat. I wonder how many of the people in these pictures stayed in the northwest, and how many eventually returned to their previous homes, once things there had improved. Dbell, that area is well known for wind! When my father was in college, it was customary for the young men to use egg white, like a precursor to hair gel! Submitted by Michael R. on Mon, 08/06/2012 - 8:45pm. It's interesting to note that the wood used to make part of the tent wall (to the right of the boy sitting on the sewing machine table) is from the shipping crate of an Atwater Kent console radio. Note, too, that 1936 was the year Kent closed the doors of his Philadelphia factory and moved to California. Five will get you ten, the radio isn't inside the tent. Submitted by Dbell on Mon, 08/06/2012 - 4:25pm. Is that a wind vane in the left background? If it used to be a windmill, there sure isn't much left! Submitted by 19thCenturyGirl on Mon, 08/06/2012 - 2:31pm. My heart goes out to these folks. Uprooting your lives and moving no telling where just to make it. I wonder how these people ended up, better or worse off. Looks like Dad and son are waiting for Mom to come in from the orchards, maybe for some mending to be done with that old treadle machine. Dads shirt sleeve and sons knee britches. I would love to have a treadle. No electricity needed!